On October 8, 2017, I joined the marathon club, and I’m a mixed bag of emotions about it. Honestly, even as I write this post, I’m wondering if I should wait another few days to really try and put it all into words, but I know I need to get it all down on paper. 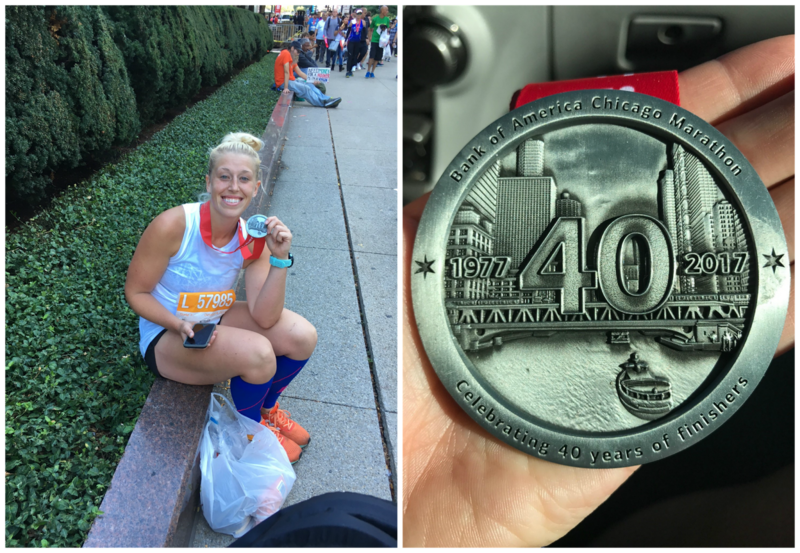 The Chicago Marathon was one of the best and hardest experiences of my life – no exaggeration. For those who know me, you know that running doesn’t come easy to me. I’m a swimmer. Running has always been my weakest suit, but I’m a competitor, and I love a good challenge. I put in a lot of work training for this marathon. There were 14-milers, 16-milers, and there was that 18-miler I did in August, in which I felt amazing. I dealt with muscle aches, fatigue, early mornings, and very late nights. But I trained hard, and I felt great…until my hip started tweaking after the 18.12 Challenge. I think that’s when I started getting mental about it. I had to seriously back off my training that last month because I could barely walk…but I kept training, nonetheless. I felt pretty good – not overly confident – but good, going into Chicago. I had a quiet time goal of 5:00 for myself, and I thought it was pretty doable based on my time at 18.12, as well as my speed work the past few weeks. The race was a totally different ballgame right out of the gate though. The morning of the race, I woke up to that special time of the month…a whole two weeks early…and every pharmacy was closed. That involved a fun stop at an aid station (thanks, guys!) because I was totally unprepared. My GPS couldn’t figure out my pace because of the tall buildings, so I was running blind, which added to my nerves. I’ve never run in a crowd like that, and the temperatures soared up to 78 degrees, hotter than I’m used to. I started having back spasms around mile 7, and I decided to give up my A goal of 5:00 and aim for 5:25 with a 4 minute on, 1-minute off pace group. I had to bail after about 30 minutes though because of the back pain. I stopped again – this time to get some biofreeze. Around the 19-mile mark, I knew I wasn’t even going to make my B goal, so I decided to stick with my C goal…just to finish before the cutoff. I found a 5:45 pace group but lost them at the water station, and I felt super defeated. I knew I had to cross that finish line though, so I kept at it going 1-minute on, 30 seconds off. At mile 22, I found a guy who had also lost the 5:45 group, and he looked like he was struggling as much as I was. I asked him what his name was, and he said it was Eddie. I asked him if he would finish the race with me, and he said yes – he would try. I was cramping terribly, so we kept a slower than slow, but still steady pace. Finally, we got to that final mile-marker and, after what seemed like an eternity, we saw a sign saying there were just 400 meters to go. Eddie’s calves locked up, so we stopped for a second so he could stretch, and then we committed to running those last meters. We crossed the finish line together at 5:53.03 (by my watch with the stops). The race was nothing like I thought it would be. I expected this immediate elation upon finishing, but I honestly felt pain and defeat immediately. Don’t get me wrong. I am SO proud I finished! The competitor in me is so mad though…and despite my immediate post-race proclamation that I would never do another marathon again, I swear that I’m going to come back, do another one, and beat my time. The race, itself, was executed beautifully. The aid stations were perfectly positioned, the city was gorgeous, and the people were fantastic. Because of the heat, firefighters were positioned throughout the course spraying water on the runners, and many of the actual residents were doing the same with hoses, or handing out candy and water. There were even people throwing thousands of icy cold sponges at us to tuck in our shirts or shorts, just to keep our body temperatures down, and it was so appreciated. It was a beautiful marathon, a gorgeous day, and a challenge like no other. If there’s one thing I’ve learned about the marathon, it’s that it’s really not a race you can fake by any stretch of the imagination. It is so. dang. hard. When you complete a half marathon, you literally still have another half marathon ahead of you, and that’s daunting. But you know what? I did it! I’m a marathoner! I’m exhausted and, yes, a little disappointed, but I learned so much about myself, too. I’m a competitor, and I’m stubborn. I don’t like to give up, and I don’t like defeat. On to the next challenge!